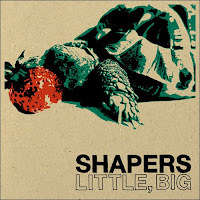 Astute followers of the Chicago music scene might recognize the names behind SHAPERS, a recently-launched experimental four-piece that will soon release their first record, Little, Big. 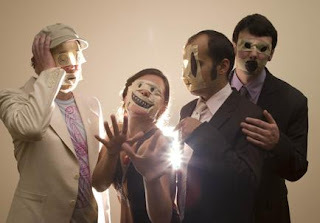 In a former musical life, Zaid Maxwell, Amelia Styer, Steve Reidell and Todd Waters played as indie pop act May or May Not, putting out a handful of releases under that name (most notably 2007's amazing A Kaleidoscope of Egos LP). While the pop of May or May Not was always left of center, SHAPERS finds the four venturing further afield. Much further. So far that it's pretty tough to classify the sounds on Little, Big. Sometimes there's Brian Eno-esque ambience (as on highlight "When I Was a Zygote"), sometimes there's brash discord ("Father Trout") and other times there's psych-pop leanings ("Autoliberation," "Milk Bug"). Another track, "Mothership Sequins," boldly extends beyond the 15-minute mark. Much of the material is instrumental, and when vocals and words show up they serve more as an additional instrument than anything of discernable meaning (see the frantic "Hot Gravy Available" - which, by the way, I declare the most amusing song title of the year even though it's only January). This isn't the kind of stuff that aims to stick after a single spin or lure you in with loads of hooks. It's more about the moods and intricacies that continue to unfold with each listen, and anyone into unconventional and experimental sounds should find that SHAPERS pull off "weird in a good way" wonderfully. Little, Big is due out in early March, with hard copies being pressed exclusively on vinyl. Click below for a download of "When I Was a Zygote," and head to the band's official site to hear two additional tracks before the record drops. MP3: SHAPERS - "When I Was a Zygote"
Check out SHAPERS live on Friday, January 15 at Lincoln Hall with Atlas Sound and Icy Demons ($15, more info and tickets here).